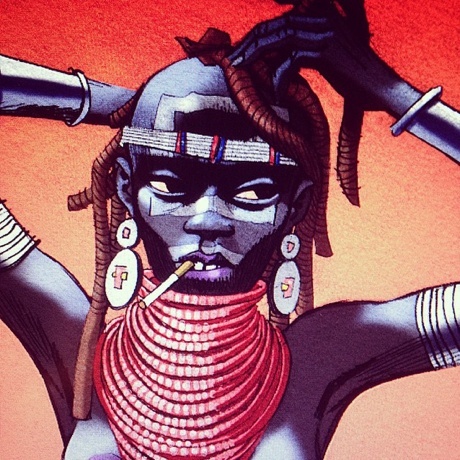 An established illustrator and writer, UK artist Jamie Hewlett is perhaps best known to music fans for co-creating Gorillaz alongside Damon Albarn. Well, it looks as if we'll all be getting the chance to know Hewlett's work a bit better, since he's revealed plans to issue a retrospective collection of his artwork, in book form. In the comments of this Instagram post, Hewlett stated: "I just finished putting together a book of my work, collected from the last 25 years. It's 518 pages big and full of all my favourite stuff including lots of unseen images." While formal release details remain vague, Hewlett assured his followers, "Will let you know when it's coming out." Stay tuned for details on the career-spanning collection and check out some of his work with Gorillaz below in the classic video for "Clint Eastwood."